Intense contrast as the storm clouds part. 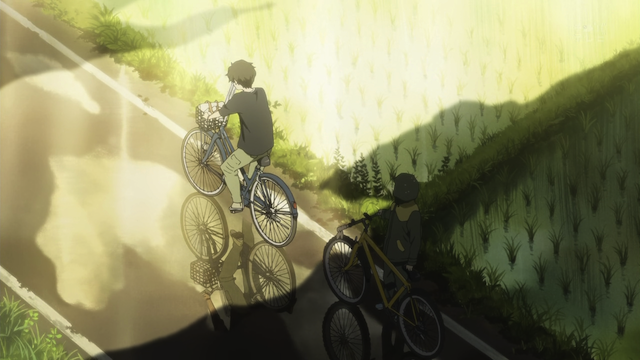 Episode 5 ends Hyouka‘s initial arc. I was extremely pleased with the way everything came together in the end. Nevertheless this is yet another post about how great this series looks. A storm against the mountains — a subject worthy of Cezanne. 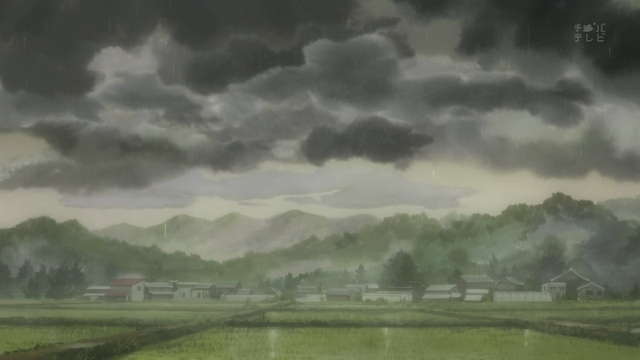 The artwork and animation in Hyouka continues to impress me. I could speak of the character growth that Oreki showed, or the details of how the mystery came together: both were good. But the thing that keeps blowing me away is how visually amazing this series is. 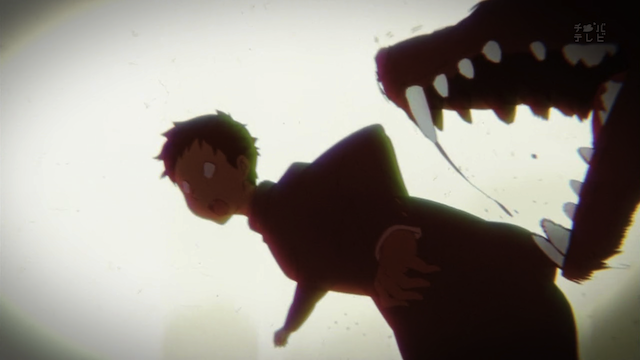 The background art, the still-life details in cut-away shots, the creative way in-story narrative is enlivened by using a variety of techniques, including animations of the words themselves … there are so many ways that this show just visually excels. Another way is in the amazing detail of things that are not critical to the plot. In the video above, you can see a 1/2 speed clip of a very short sequence in which the characters leave the club room. This is the sort of scene that is never animated, because it is easy to find ways to cut it, or work around it. And yet here, Kyoto Animation has taken the time, effort, and money to animate in detail the process of getting up, collecting things, pushing in chairs, and so forth. In one way, these gratuitous animations are showboating — nobody else would attempt such a sequence, so they are a sign that we are watching the indisputable masters at work. On the other hand, such sequences do have an effect; they give Hyouka a quality of existing in a real world, one that isn’t made for the convenience of this story. There are what can only be assumed to be real people in the backgrounds having their own conversations, living their own lives. To sum up, this first arc was very impressive. I am certainly looking forward to seeing more of Hyouka. This really is a ‘Love Letter to Animation’, isn’t it? And the conclusion was well done. I was a bit surprised at how rather blunt it was about what happened to Sekitani Jun, all too often anime will tend to try to gloss over such things. I have to mention the music as well, especially the use of Bach’s Cello Suite #1. It’s a personal favorite of mine, and amusingly I was first (knowingly) introduced to it via anime; Neon Genesis Evangelion in fact, it’s the piece Shinji plays in the apartment. It wasn’t until I saw Yo Yo Ma play it on an episode of West Wing that I learned that what I thought were mistakes aren’t. Such a wonderful piece. Yeah, I guess we can assume Jun had some difficulties in life after that, since he never graduated from high school. He probably would have been inclined to go to college otherwise, since he was in the Classical Literature club. As to the music, I also am a big fan of Bach’s cello suites. I have been wondering what went into thee decision to use so much classical music for BGM. Perhaps it is cheaper than commissioning new music.